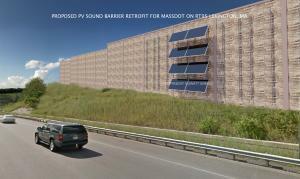 Lexington could pave the way for a new solar noise barrier photo-voltaic panel installation on Route 128. NuWatt Energy is working with MassDOT along with its strategic partners Ko-tech, Ramboll and SSM to construct the first solar noise barrier retrofit in the US. The system will be installed on 2,500-ft along a stretch of Route 128 in Lexington. The project would produce 825,000 kilowatt hours of electricity, to be fed into the Eversource power structure and MassDOT will be the off-taker of the energy. “This is a challenging but very promising concept” said Dr. Aiman Alawa; NuWatt Energy’s CEO; who is spearheading the conceptual and practical design of the project, “The idea that we will be able to offer these smart noise barrier walls as a P3 (Private Public Partnership) effort is very exciting. We have received many inquiries already from various DOT’s from across the United States and we are excited to be able to offer a solution that provides many benefits beyond solar energy and beyond noise reflection functionality. The 166 wall sections would be located on the south side of Turning Mill Road. The panels would be installed along a stretch of sound barrier walls on Route 128, land owned by the state of Massachusetts. “We are anticipating having shovels in the ground in June of next year (i.e. 2017),” said James Cerbone, a project manager for environmental services for the Massachusetts Department of Transportation. Dan Fielding, a public and legislative liaison for MassDOT, said the state does not have to gain permission to install the panels, but will not move forward if Lexington residents are against the installation. “MassDOT is not legally required to get permission for the pilot study, but will not move forward with the pilot study if there is opposition from a majority of the abutters,” Fielding said. The barriers at this location were installed several years ago after residents complained of highway noise. Wood said the addition of solar panels would decrease the noise even further. Cerbone told the selectmen private companies will pay for the installation. Lexington residents will not have to pay for the panels. The state will be looking to further develop the proposal, and contact abutters about their thoughts on the installation. Cerbone said abutters should expect to be approached before the end of the year. The project is a pilot study for the technology.